Have you thought about getting a spiralizer before? Like the idea of occasionally swapping out carb-loaded traditional pasta noodles with veggie noodles instead? The Kitchen Supreme piral Vegetable Slicer for Healthy Salads and / or Pasta makes it fun and easy to add more veggies (or fruits!) to your meals. Stop by my Spiralizer Pinterest page for tons of great recipe ideas! I love how creative people get with spiralizers - everything from sweet potato spaghetti to spiralized pear yogurt / granola cups for breakfast. And I definitely want to try the spiralized apple funnel cakes I saw - yumm! I am hoping to post some spiralized recipe made in my own kitchen soon - but until then, I hope you will check out this terrific spiralizer and some of these delicious looking recipes to whet your appetite! This is a fantastic little set - the cleaning brush works very well, and I love the two different blade options. 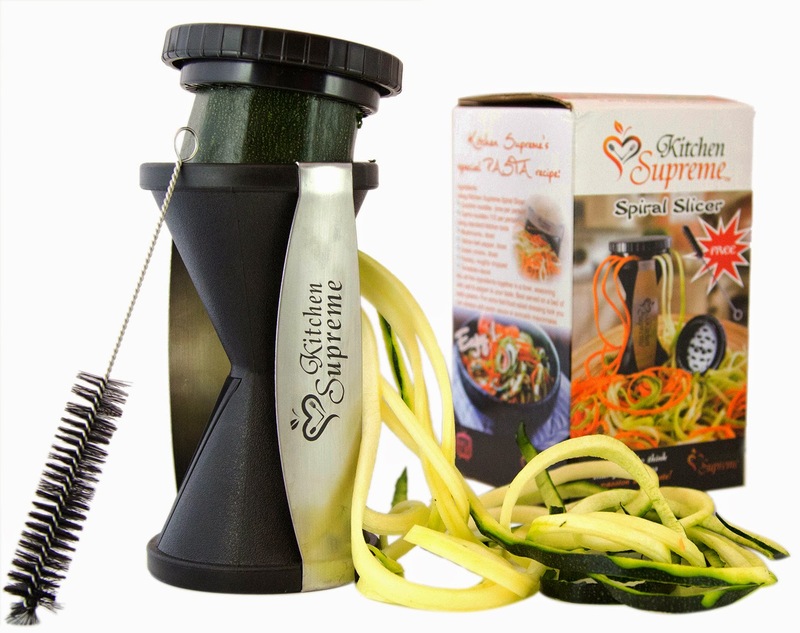 It's quick and easy to use - you can turn everything from a zucchini to a pear into a spiralized dish in no time! I tried to do something with the sweet potato you see at the beginning of this post, but it just did not come out the way I wanted, so I will try, try again and get it right soon and then share some yummy spiralized dishes from my kitchen here soon. 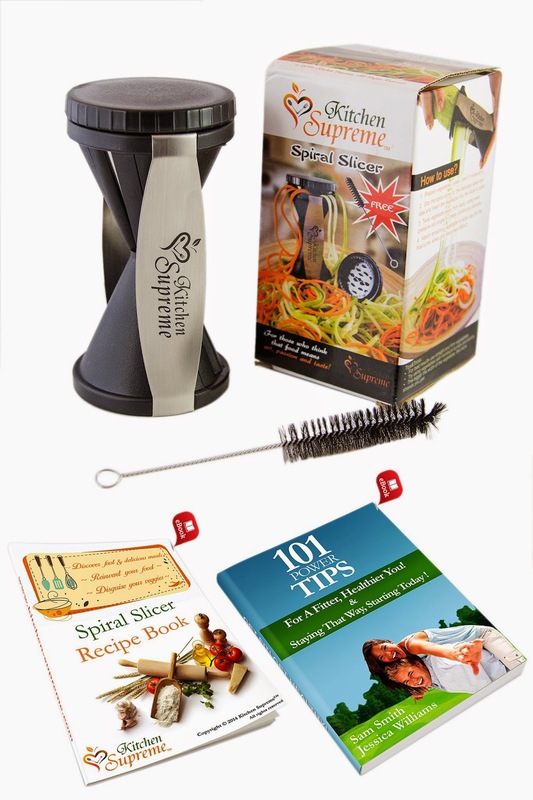 SUPERIOR VALUE for the Complete Spiralizer Bundle: The Kitchen Supreme Spiralizer + Flexible Cleaning Brush + Storage/Protective Bag + Spiral Slicer Recipes Digital Cookbook + Rapid Results Digital Guidebook - 101 Power Tips for a Fitter, Healthier You ! RELIABLE: Built from BPA-Free ABS Plastic and Heat-Treated Stainless Steel. Two High Class Japanese Razor Sharp Blades, guaranteed not to rust or loose sharpness qualities in time. Built-In Finger Guard Protection And Safety Cap. | CONVENIENT & USER FRIENDLY: Comes assembled and ready to use ! No Annoying Extra Attachment to set up, that take up your space and time. It's Dishwasher safe and Compact, easily stored in the kitchen drawer. Super-easy to use ! THE BEST CHOICE: Best spiral slicer for anyone on a Raw Food / Low Carb / Gluten Free / No Wheat / Paleo / DIET ! A PERFECT GIFT for Moms, Cooks and healthy-conscious people, making their life fun and easy. Most important for parents, it makes vegetables fun and attractive for children. PERFECT GIFT for FAMILY and FRIENDS ! HELPS YOU TO: ENJOY YOUR MEALS, even if you are on a DIET (Raw, Vegan, Low Carb, Gluten-Free, No-Wheat, Paleo, etc. ), REPLACE HIGH CARB Pasta or Noodles with healthy and colorful veggie ones, Get your picky CHILDREN and FAMILY to EAT plenty of healthy VEGETABLES in disguise, SAVE TIME from slicing, dicing and conventional julienning methods, CRAVE for VEGETABLES ! Your veggies will look mouth-watering and still keep nutrients and minerals alive. Buy with confidence: We have thousands of Happy Customers and over 500 positive reviews!